This was the concept used for the human version of The Prophet character in chapter 3 of Oats Studios Adam. I was asked to design The Prophet so that he would have subtle indications that there was more to him than meets the eye but not so obvious that it would give it away entirely. 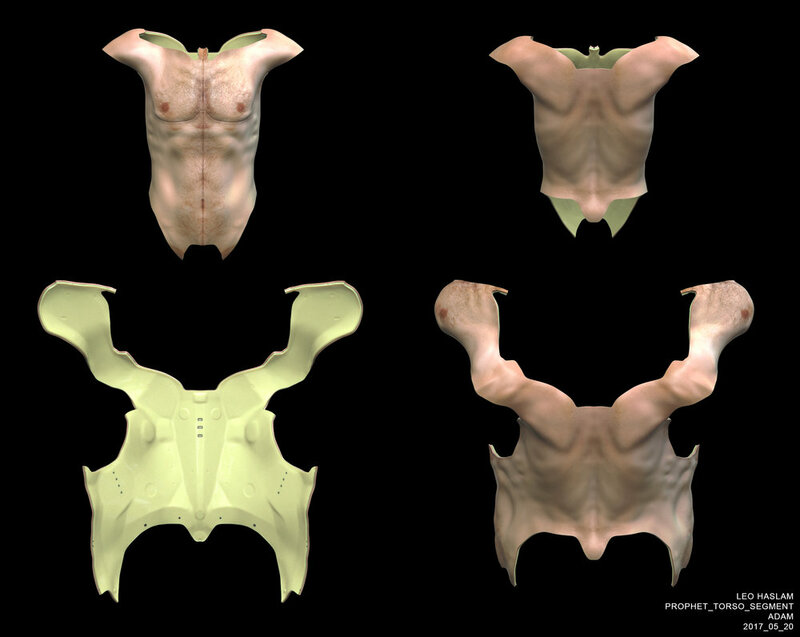 One of the ideas was to disguise the seem lines between the skin panels as scar tissue. 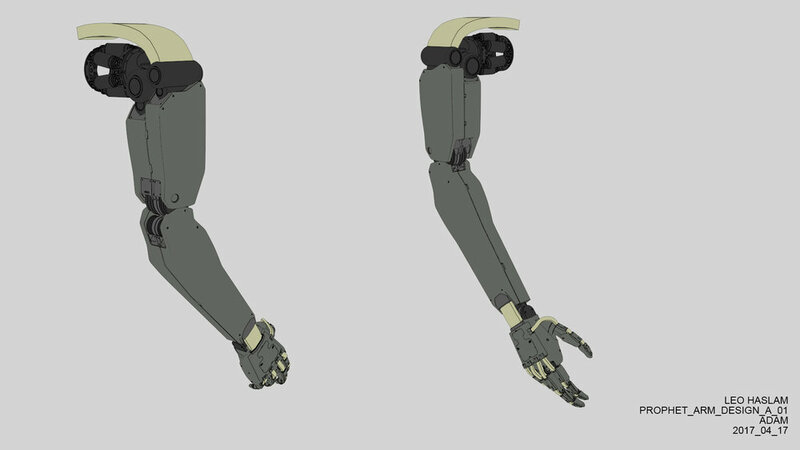 Ian Spriggs created the animation model based on the actor Michael Rogers who played The Prophet. This was my favorite and most challenging part of working on this project. I went through a lot of different versions before finally reaching this one. Neill wanted something that would fit inside the human form but also feel non human. Neill suggested incorporating four arms into the design and I came up with the idea for transforming the leg into the double hinged demon like design. I used a few of Vitaly Bulgarov's kit bash pieces in this design but each one was heavily modified to fit my concept. 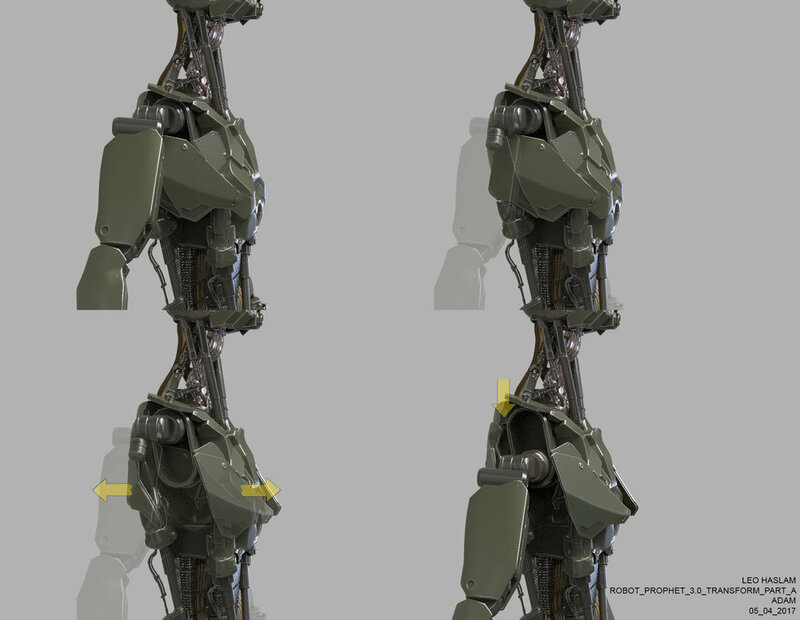 Some of the later renders feature an alternate head but this was eventually changed back to the original design. By using Zbrush to create this concept I was able to pass on the 3D file so that it could be retopologiesd and rigged for animation. Jeff Tetzlaff was responsible for the final model and did an awesome job at designing the joints so that they could actually articulate. Theses are the concepts I produced for the final scene in the film where The Prophet reveals his robotic form hidden under his synthetic skin. I had loads of fun designing how his robe and skin would come away and I'm supper happy that this part made it into the final movie.